The flavor of fresh apple cider is amazing, and the process of squeezing cider from apples is fun and easy with an apple cider press from Pleasant Hill Grain. You’ll find the flavor of your juice so superior to homogenized, store-bought apple cider that they shouldn’t be called by the same name. Speaking of names, we’re sometimes asked what the difference is between simple apple juice, and apple cider. Part of the answer is that different people use these terms differently. One thing there’s no debate about is that what comes straight from the apple can be called apple juice; but after that, opinions differ. Some people maintain that only fermented, alcohol-containing cider can properly be called cider. Others (including ourselves) consider the term hard cider to distinguish the fermented product, holding that the simple term cider refers broadly to both hard and fresh types. Non-alcoholic cider is often also called soft cider. 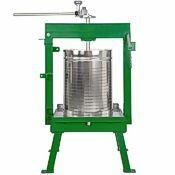 Whether you prefer soft or hard cider (or some of each), the steps and the equipment used at the extraction stage are the same. All of our machines are built with smart features and a level of quality that make them a joy to use and will keep them working for years and years. Below are some of our favorites! The MacIntosh apple cider press is sold exclusively at Pleasant Hill Grain and incorporates design features found nowhere else. 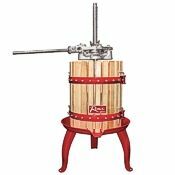 Built for quick and easy operation, this apple press features a tip-away frame yoke that gets the forcing screw and pressing plate out of your way for both filling and unloading. 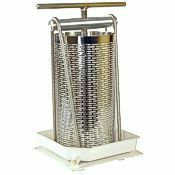 Our MacIntosh cider press has a stainless steel juice collection pan and extra reinforcement under the pan to withstand extreme pressure—allowing you to extract more juice than you could with presses of lower quality. Two models of the MacIntosh cider press can hold either 4 or 5 gallons of fruit pulp. Like all of our other presses, the MacIntosh also works equally well for grapes, so it’s a fully qualified wine press as well. 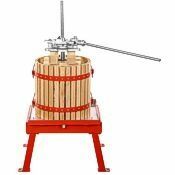 Our Maximizer® and Glenwood apple cider presses represent the zenith of hand-crank cider press design. Their frames are built of heavy-wall square steel tubing with heavy duty hardware used throughout. Both offer capacities of 5.3 or 9.5 gallons of pulp. The strength of their frames let you apply enormous pressure to your pulp for a very high juice yield. Strong (and long) ratcheting handles makes it easy to apply that pressure, and pivoting pressing beams provide wide-open access to the top of the basket for loading ground apples and unloading spent apple pomace. The GSAM feature of this press stands for Grinder Swing Arm Mount. 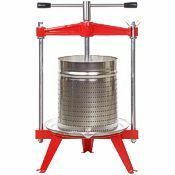 The GSAM design allows you to add an optional Maximizer® hand crank apple grinder to your press and mount it where you can grind apples right into the pressing basket, then quickly and easily swing it completely out of the way for the pressing operation. With any apple cider press, you’ll get far more juice from your apples if they’re properly ground first, as you can see in the photo at right. The Maximizer’s GSAM feature adds a great dimension to an already outstanding press, and equips you to juice a lot of apples in short order. 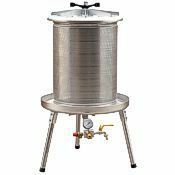 Taking another step up brings us to the stainless steel hydropress, available in 80 liter (21 gallon) or 40 liter (10.5 gallon) capacity. Despite its large capacity, the remarkable design of this fruit press reduces human effort for the task of fruit pressing to absolutely nothing. You just load and unload the machine, and water pressure does all the squeezing. 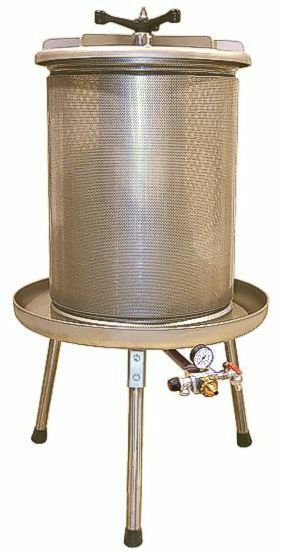 With its all-stainless construction and fast production rate, the 80 liter hydropress produces more juice for your investment than any other design. Whether you have a few trees or an orchard, this machine will do a great job. The table below lets you compare the features and key specs of our fruit presses, and more details are available on individual product pages. If you have questions not answered here or would just like to discuss your particular needs, our knowledgeable customer service representatives would love to talk with you. Pleasant Hill Grain provides a superior online shopping experience for fruit harvesting and food preparation equipment. We know and use the products we offer, and carry only machines that will give you strong performance and long-life durability. Shipping is free on all apple presses and grinders, and knowledgeable support from our friendly customer service staff is just a phone call or email away. See our full line of fruit presses here. We would appreciate your business and look forward to the opportunity to serve you!